If you want to publish common e-documents to HTML5 flipping book, you would in need of FlipBook Creator (Pro). 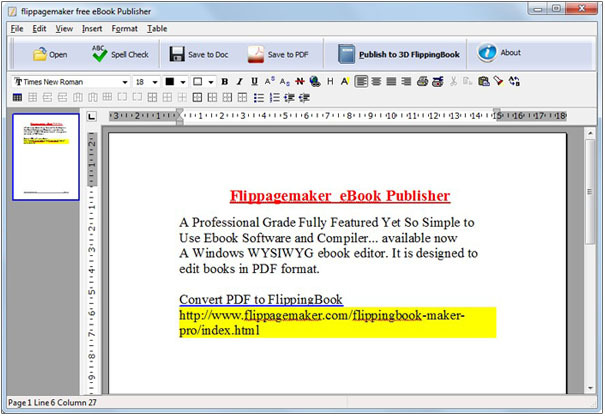 Free eBook Publisher is completed freeware released by FlipPageMaker. It is a comprehensive application that was built as a converting and publishing utility for creating professionally formatted content. With the help of this application users can easily add Text and RTF files and create Doc and PDF archives. To provide eBooks that satisfied readers’ appetites, let’s know more about what eBooks actually are. EBook is electronic, downloadable books that can easily be accessed on a wide range of eReader devices and platforms, like Apple iPad, Mobile device, and your home computer. Millions of customers discover new ways to purchase and read eBooks every day. Free eBook Publisher is such practical application that will help to achieve the critical first step successfully. Then what can you do with Free eBook Publisher? Setup page layout contains Page Size, Margins, and Orientation. Copy/Cut/Paste operation would help to save a lot of time. Add table to anywhere on pages. Insert hyperlink to targeted part. All in all, Free eBook Publisher is powerful application for publishing eBooks. It is free, even though it provides many useful features. When the install is complete, please remember to feed back your name and email, we will send you kind email when there is newer version. To convert the exported PDF file to flip page turning magazine, flash brochure, or manual with multimedia, you can refer to FlipBook Creator (Pro). Flip e-publication that support HTML5 and Web 2.0 will be greatly welcomed!